Any of you have noteworthy classical music memorabilia? Yes, yes...most of you have (or had!) incredible recording collections. But how about memorabilia, collectibles, etc? Signed poster by Yo Yo Ma? Autographed score by Prokofiev? A baton that Bernstein threw into the audience after a Mahler performance? I, for one, have none. But I'm curious if y'all have stuffs! Re: Any of you have noteworthy classical music memorabilia? Many hundreds of programs for performances I've attended - music, theatre, dance, whatever. I never throw them away. I never get them autographed either. Other than that, and recordings, I have no memorabilia, just memories. I've several signed photos: Gulda, Szeryng, Thibaud, Ricci, Oistrakh, Borovsky, Lewenthal, Karolyi..and one big Heifetz signed on front and back. You see, all of them (and many more) were at least once in Buenos Aires, and played probably at the Colon Theatre. But that was before the barbarians took power. Cecilia Bartoli signed my program after her Concert in Oslo in ca. 1995. I shook her hand and I all managed to say was "Thank you". I also bought online some years ago a copy of "Tribute to Benjamin Britten" where Rostropovich had signed his Chapter. oisfetz wrote: You see, all of them (and many more) were at least once in Buenos Aires, and played probably at the Colon Theatre. I studied in Buenos Aires for a month and had a piece performed at Teatro Colon....back in...2007 I think. Wonderful place! Not sure if that was before or after the invasion, though. I have pictures of my parents having dinner with Luciano Pavarotti during his first visit to Mexico in 1969. No, they didn´t take me because I was 8 ha,ha. I have a formal letter written to conductor/cellist Fritz Wallenberg (founder-conductor of the Binghamton Philharmonic Orchestra) signed by cellist Emanuel Feuermann. Signed photos or record jackets signed by Mischa Dichter (signed to me with the notation: "Thanks for saving my life in Binghamton" after I worked on his Steinway prior to a concerto performance), Leonard Pennario (whom I interviewed from where I type this), sopranos Geraldine Farrar, Deborah Reidel (signed to me prior to her untimely passing including a lovely personal letter). A really precious one for me is a photograph with me and pianist Artur Rubinstein. Another is the book Miracle Makers: Stradivari - Guarneri - Oliveira, personally signed to me by violinist Elmar Oliveira, and also a colour photograph with him taken during a party. Still another, a photograph (also on the Internet) with pianist Leon Fleisher whilst working on his piano. I have a colour photo with harpischordist Igor Kipnis taken while working on his harpsichord for a recital. Also many letters and postcards from pianist Ruth Slenczynska, and a signed Christmas greeting card from Dame Joan Sutherland. Also a letter from the king of piano accompanists, Gerald Moore, who contacted me about meeting him in England; alas, the plane was late and we could not get together. I have photographs and interview tapes with Howard H. Scott of Columbia/RCA Records who produced recordings for Glenn Gould, Eileen Farrell, Bernstein, Rodzinski, and countless others. There are more, but can't think of them at the moment. Program with Box seat ticket stubs from the MET 100th Anniversary Gala (afternoon program) autographed by Kurt Baum, Rose Bampton, and Lorenzo Alvary. (I was invited by Baum to be his companion for the event). Concert flyer autographed in gold by Yo Yo Ma. Not to mention copies and recordings from 95 programs I produced myself (about half in Carnegie's Weill Hall) with young conservatory graduates, some of whom went on to fine if not world-famous careers. When I lived in Eugene, I was at an early-90s concert where the local orchestra played one of Hovhaness' many symphonies, and he was present along with an aide/partner. I had him sign my program, but I lost it in the move to Seattle. In the 1960s (I can't recall the year off-hand but it must have been the early '60s) I attended a recital by Glenn Gould at Concordia College in my hometown of Moorhead, Minnesota. Like all concerts in the college's artist series it was held in the field house where the basketball games were played. I couldn't imagine a more inappropriate venue for a piano recital. The Steinway was perched up on blocks and the famous chair that Gould's father made for him was in place at the piano. There was a considerable delay in the start of the program (Gould was probably in his dressing room soaking his arms in warm water). Then a stagehand carried out a glass of water and placed it on the piano. Finally after several minutes Gould shambled out and began to play. It wasn't very long before we could hear the well-known Gould vocalizations. One of the two elderly ladies sitting behind me asked the other, "do you hear someone singing?" The other observed, "he certainly does feel his music." 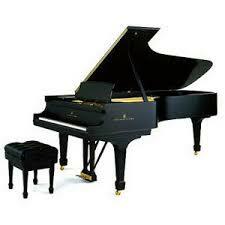 Raised up on blocks, the Steinway was rocking slightly back and forth, causing the water in the glass to slosh around. After the concert I joined friends at the only nice hotel in town for coffee. As we were sitting in the restaurant sipping our coffee I noticed that Gould had just arrived in the lobby. It was winter (as I recall) and he was attired in a very long overcoat, a heavy scarf, thick gloves and galoshes. I hurried out to the lobby and asked if he would autograph my program. He very kindly consented to do. Unfortunately I can't recall what I might have said to him, if anything. That autographed program must still be around the house somewhere because I never throw anything away. The only work I definitely recall on the program was the Berg sonata and there was something by Bach of course. If I ever locate the program I will post it here. I don't generally ask musicians for autographs because I think it is kind of tacky but I do have a Met program signed by Birgit Nilsson and a record jacket of Beethoven sonatas signed by Claudio Arrau. I got Angela Hewitt's signature on a WT Clavier. But mostly I agree that it's tacky to ask for autographs, especially when I was working. When I was a child I collected autographs from cricketers. I would write to them, incuding a postal order for the cost of the stamp. The Australian legend Keith Miller, a war hero fighter pilot, not only wrote me a lovely letter (which I still have) but returned the postal order, and sent me Christmas cards for a few years. Others who were generous included Len Hutton, Peter May, Colin Cowdrey and Don Bradman. this will mean nothing to those who live in the US - sorry! Because everything is on the tubes now! I have a very nice autographed photo of Stokowski from 1927. It's a photo I've never seen anywhere else too. A very nice acquisition, indeed. Stokie ... one of my favs! bigshot wrote: I have a very nice autographed photo of Stokowski from 1927. It's a photo I've never seen anywhere else too. Once, back in the fifties I happened to see Albert Schweitzer on the same ferry as I travelled with. I went up to him and asked for an autograph. Unfortunately I had no paper at hand so I took up a picture postcard with a picture of - Wagner!. He kindly signed it, but I felt embarrassed. Even though I don´t collect autographs I have a couple like by Alfred Schnittke, and Birgit Nilsson. As B.N. and I are from the same part of Sweden we had a good time speaking our provincial language. parsifal wrote: Once, back in the fifties I happened to see Albert Schweitzer on the same ferry as I travelled with. I went up to him and asked for an autograph. Unfortunately I had no paper at hand so I took up a picture postcard with a picture of - Wagner!. He kindly signed it, but I felt embarrassed. Even though I don´t collect autographs I have a couple like by Alfred Schnittke, and Birgit Nilsson. As B.N. and I are from the same part of Sweden we had a good time speaking our provincial language. You were mature enough to recognize Albert Schweitzer at all, let alone as a musician when he is generally better known for other things, in the 1950s? Either you were very precocious, or you are __________ years old. When I saw Albert Schweitzer I was 21 and had read much about him. he was on his way to Copenhagen to receive the Sonning award.